Love Chinese Chicken Salad? Then you will LOVE this lighter, vegan version! Cabbage, lettuce, carrots, edamame, almonds, chow mein noodles and crispy seitan chunks covered in a sesame ginger dressing. Heat a cast-iron or heavy skillet over medium heat. Toss the seitan pieces with soy sauce, and then with the flour to coat. Add the olive oil in a single layer on the bottom of the skillet. Add the seitan to the skillet and cook, stirring occasionally, for 6-7 minutes until golden browned and crispy. Remove, and place on a paper towel and allow any excess oil to drain off. Let cool slightly while you prepare the salad. Combine all of the ingredients for the dressing together. Set aside. 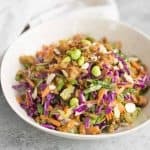 Combine the shredded lettuce, cabbage, edamame, shredded carrots, chow mein noodles and almonds together in a large bowl. Add the dressing and toss to combine, until well coated. Add in the seitan pieces and toss once more. Season to taste, adding salt/pepper as needed and enjoy! I don’t always cook with seitan, so if you don’t want to use it, then my crispy tofu cubes would be awesome in this! If you use this recipe to make seitan, then you don’t need to batter it with soy sauce/flour first.